For those who know the difference, coffee is not just a drink. It’s a lifestyle, a little thing that helps to begin or finish the day. If you are keen about how to brew coffeehouse-style drinks at home than Cafe Barista Premium System (ECMP 1000) by Mr.Coffee was designed for you. True espresso lovers desiring to brew invigorating beverage at home won’t be disappointed in purchasing Mr.Coffee coffee machine because it has several very convincing advantages. 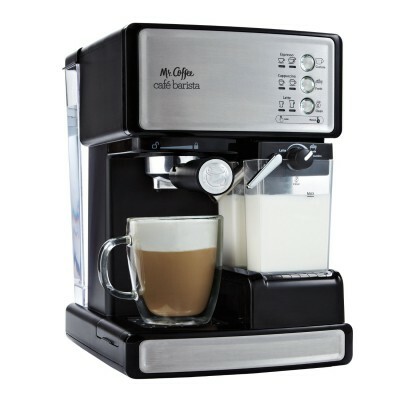 Mr.Coffee Cafe Barista Premium Espresso/Cappuccino System is a modern coffee maker that allows you to brew perfect coffee of three actual types: classical espresso, cappuccino, and latte. Special technology performs a high class of coffee brewing that’s comparable with beverages made in the coffeehouse. It is also frugal in energy consumption, the thing that made it useful at household. The system has one-touch control panel with three backlighted buttons that will allow you to brew the beverage you want with one touch of your finger. You only have to choose the coffee type and mug’s size. Mr.Coffee will do the rest. And also you can choose the volume of your cup: the first push will brew 40 ml of coffee, second push ― 110 ml. Mr.Coffee Cafe Barista System has two removable reservoirs. First one is for water. It’s situated on the backside of the machine and has a volume 55 oz (almost 1700 ml). So, you can brew several cups of different drinks before it’s empty and needs refilling. The second tank is for milk. It has the volume about 16 oz (almost 500 ml) and is situated under the control panel where you can find a slider for foam intensity. More you slide – more intense become milk foam. Both tanks are made of strong glassy plastic. Mr.Coffee Cafe Barista has a rather powerful electric pump that can produce pressure about 15 bars. This count is regarded as perfect for classical espresso brewing. 15 bars allow getting more intense beverage with classic dense crema in its surface. By the way, the pump pressure of Mr.Coffee Cafe Barista is regarded among the coffee lovers as the most optimal for the home use in whole Mr.Coffee’s series. The power of pump allows to brew classic espresso less than 30 seconds, and it’s the best time for a coffee machine of the class. The machine has a pair of shot filtres. You can choose among them for coffee volume and intense. They are very simple to use and this can be considered as the undoubtful pro for the Mr.Coffee Cafe Barista System. You just fill them with ground coffee, insert in the special slot and turn. Those are the most notable features of Mr.Coffee Cafe Barista coffee machine. We can regard them as pros of the whole system because they can become one of the reasons you will purchase this product. Now, let’s make some summary. two aluminium shot filters (one and double-shot) will help you to brew that quantity of coffee you want. it’s noisy: pump produces loud sounds that can be heard not only in the room where coffee machine stands. So, if you are the coffee lover and you are keen to find the coffee machine that would brew barista-style coffee for you than Mr.Coffee Cafe Barista is made for you. It is cheap, functional and useful for those who appreciate one’s time.